I got an email yesterday asking if I was a real person. Of course! 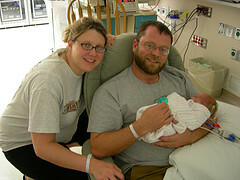 To document my reality, here is a picture of my wife and me when our daughter was born. I'm glad to be able to cross off being-a-real-person off my to-do list. Anyway, yes I am real and I do write each entry by hand--no skimping here. Thanks for your inquiry.